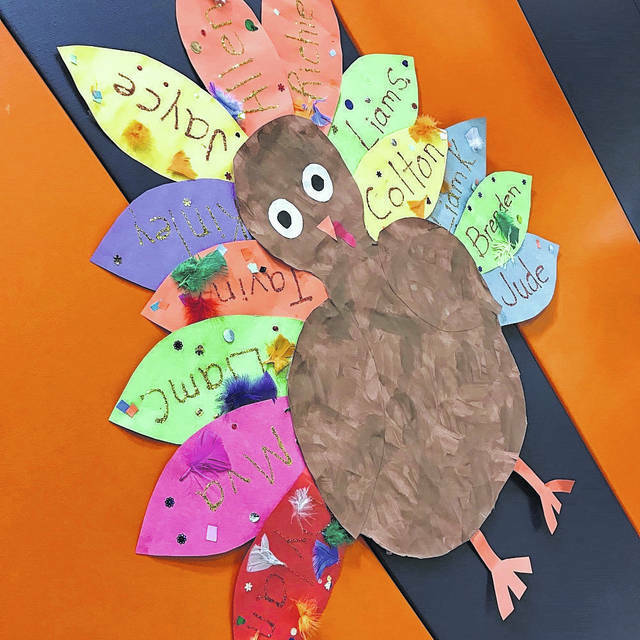 GALION — Students who attend Galion City School spent time celebrating the Thanksgiving holiday Tuesday, prior to the start of the district’s fall break. Galion Intermediate School students began their day with a presentation from Rev. Dr. Wilson Mugambi Marimi. Dr. Mugambi, originally from Kenya, received his Doctor of Ministry from Ashland Theological Seminary where he majored in Transformational Leadership. Galion Primary Preschool students enjoyed a Thanksgiving feast with classmates and family members. More than 200 people, including residents from a local nursing home, enjoyed the meal prepared by students’ family members in both the morning and afternoon class sessions. Primary School staff members and district administrators, including School Resource Officer Burwell, served the meal to the attendees. Members of the Primary School’s Leader in Me Student Lighthouse Team served as greeters and helped serve the meal as well. Sixth grade students at Galion Middle School dressed up for a formal etiquette dinner as well. Students studied The 55 Essential Rules by Ron Clark during Tiger Time, with the “ABC’s of Etiquette” being one of the rules covered in the book. The business community was involved in this year’s event. The Brown Derby Roadhouse donated mashed potatoes and gravy.